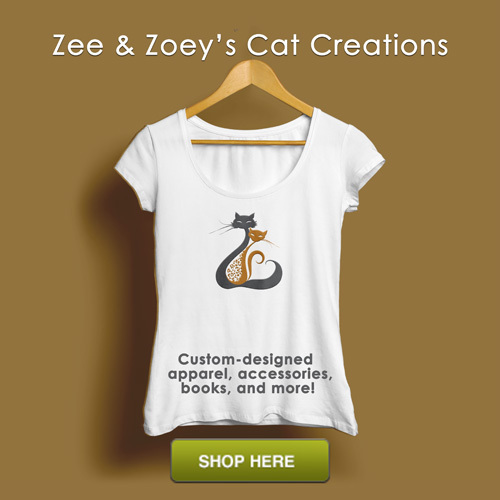 Catreesort – Product Review and Exclusive Discount Offer for Zee/Zoey Readers! 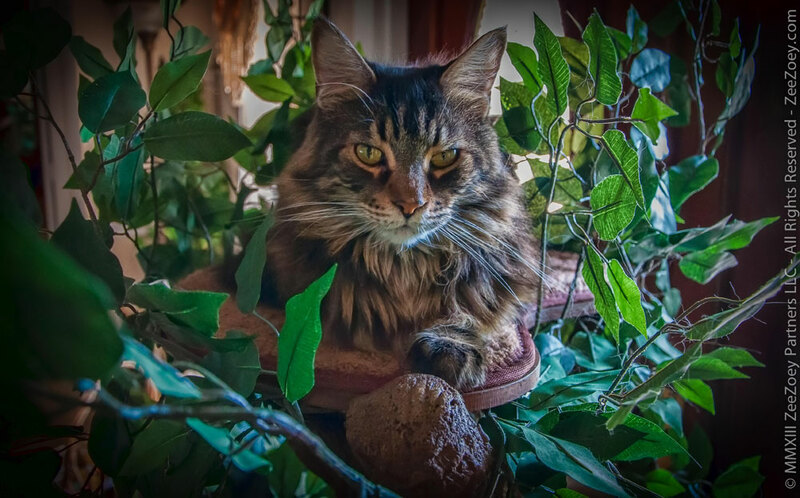 The email was brief and simply said “I am a manufacturer of a new great cat tree called “Catreesort” designed to look like a real tree in your house, and yes, it’s washable!” I get a lot of emails about cat products for me to try out, but very few catch my attention as being something new and unique. 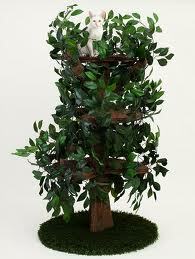 This one, however, intrigued me – my cats love trees and I wanted to see what a cat tree resort actually looked like. Somehow I envisioned it as something I might see on an episode of Jackson Galaxy’s “My Cat From Hell” as a positive behavioral apparatus to keep a cat happy and stimulated and I wanted to see if my instinct was right. When I went to the website I instantly knew my gut feeling was spot on and that my cats would adore this tree! 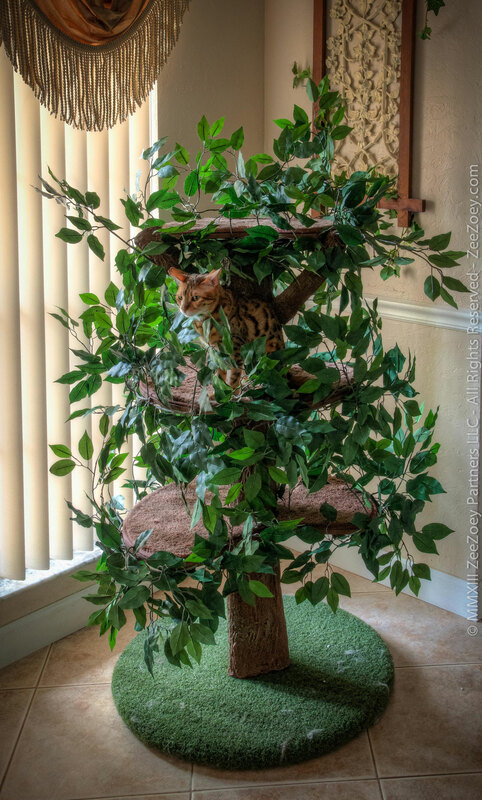 This kitty condo was the ultimate piece of designer cat furniture and I fell in love with the entire concept – a 5 foot tall, three tiered tree that had carpeted shelves for napping and scratching that were surrounded by lush greenery and simulated tree bark that would give any cat the feeling of being a wild animal out in the jungle, but not give a pet guardian the worry of the cat being outdoors. I immediately contacted the manufacturer to introduce myself and to see if I could possibly test out and review the product for them, courtesy of my gang of eight very discriminating felines. Turns out the manufacturer is local, which is wonderful. 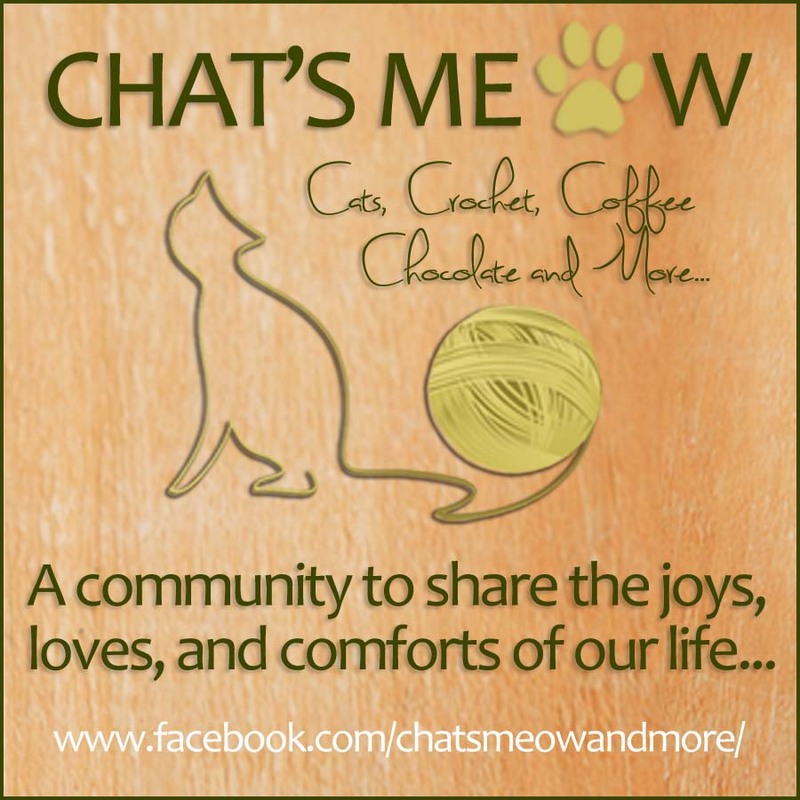 I am a huge proponent of helping local businesses and I knew I wanted to team up with this company and help get the word out about them to my fellow cat lovers who are looking for that extra-special piece of furniture for their beloved feline(s) that would not only look amazing in their home, but would give their cats the ultimate experience in cat condo living. Through correspondence, I became friends with the owner and founder of the company, Leesa Mulligan, and she decided she wanted to meet me in person and so we made arrangements for her to drop the tree off at my house. The day she dropped by the house was a very exciting one for my cats to say the least. Leesa is well versed in “cat language” and my gang were instantly drawn to her and the mystery box she brought with her. I was interested in the box too – it was quite large – 29” x 29” x 19” and weighed 48 pounds. But don’t fear, once you open the box, the tree itself is relatively light – it is the pole that holds the tiers together that is heavy. 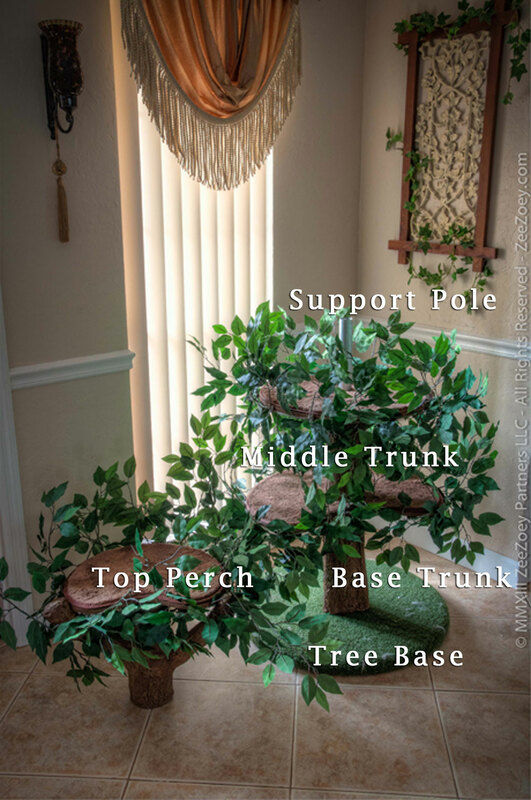 Each box is packaged with a sturdy base, a pole stand, and three leafy, carpeted tree tiers. 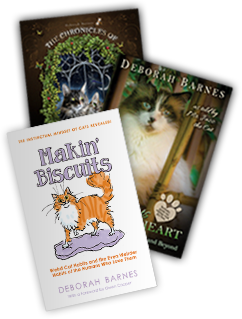 The assembly process is incredibly quick and easy (other than it taking a long time because your cats will be jumping in and out of the box and assisting you in every assembly phase). No tools are needed and you do not require a partner to put the tree together. Seen here are the main components of the Catreesort. It is partially assembled here with only the top perch left to put on the tree. Once it was assembled, our Kizmet immediately claimed the top tier and was in “King of the Tree Top Heaven.” He wasted no time telling the others that the tree resort belonged to him and that if the others wanted to be a part of it, they had to settle for the lower tiers! Eventually he gave in and all of them took turns at the top. Once they all had experienced the “penthouse” view, they started to relax on all of the tiers and that is when I saw the magic begin. The tree released their “inner feline” and I could see them emotionally energized by the stimulation the Catreesort provided them. Even my senior boy Jazz is who not feeling so well, took to this tree, reveling in the privacy it gave him, while at the same time being part of the family. I cannot possibly do justice to how Kizmet felt once the Catreesort was finally assembled. He scurried up to the top perch like he owned the world and the happiness that radiated from him as he claimed his role as “top cat” is something I will never forget! Once Kizmet let the others have a view from the top, Zee quickly grabbed his turn. You can see how the lush foilage gives him a sense of security as he comfortably rests on the padded perch. The reason for this emotional outlet is because the leaves give them the distinct impression that they are completely hidden from view, enabling them to be grand hunters. I can’t tell you how many times I have walked by to feel a completely unexpected paw reach out and touch me by surprise! 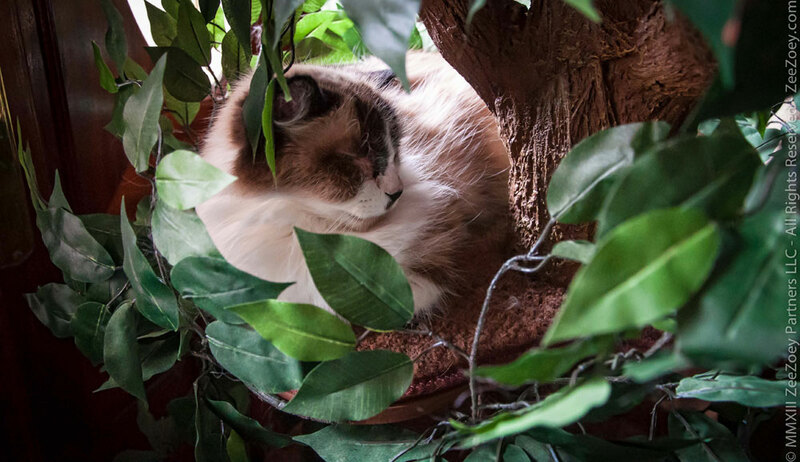 They all love napping, scratching, and playing on the tree and I am thrilled for them to have this outdoor experience available to them indoors. 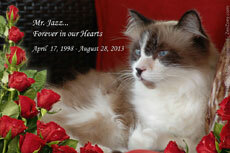 I will forever cherish this image of my elder cat, Jazz, as seen here in the middle perch of the Catreesort. He has not been doing well physically, but I just sensed an aura of peace about him as he napped in a cradle of hidden security. This photo also gives you a nice view of the detail in trunk design of the tree. 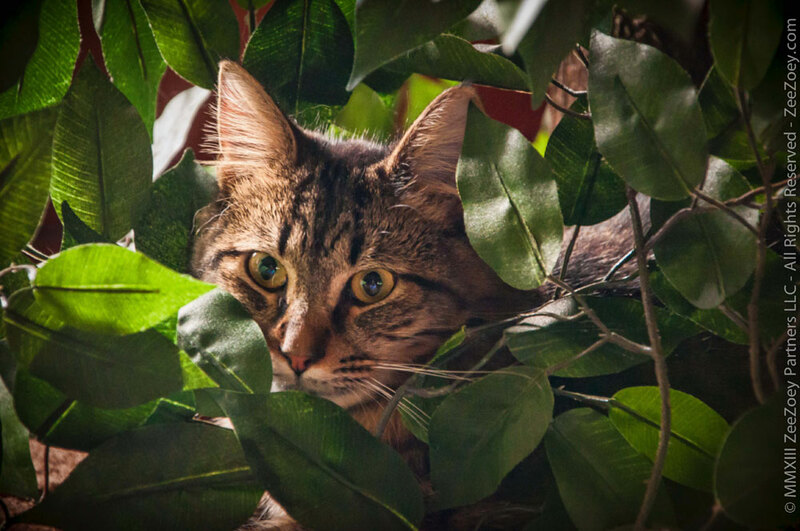 The best part – all the tree components can be removed for cleaning and if kitty has an accident, the carpet lined tree perches are removable for washing, unlike your typical carpeted cat condo, and the base and carpet tiers also have replacement pads available. Now, I will be honest with you. This is a quality, one of a kind piece of furniture and it is not inexpensive. I consider it an investment that will bring years of joy and happiness to your cat that is also a practical and well-designed piece of furniture. The tree has won numerous “Best Product” awards, is patented, and they are assembled in the USA. I encourage you to browse their website for further information and to see additional products available as well as testimonials. Seen here with miss sourpuss Zoey, is the tree fully assembled. 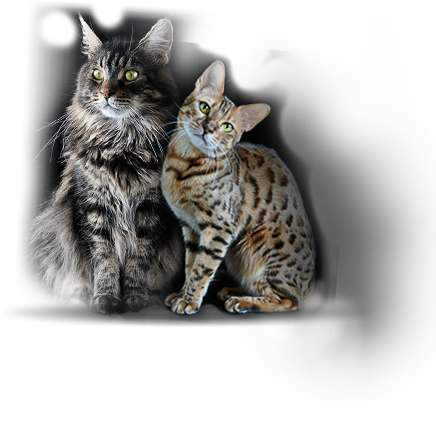 We have since moved our Catreesort next to one of our older cat condos and have incorporated it into one large, exciting, and incredible cat condo experience where the cats can jump from one level to the other and are having a ball with it. 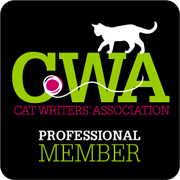 We give the Catreesort a 5 paws up rating and are so thrilled to have one in our home! So, how do you get one for your cat? I have great news – as a courtesy to Zee/Zoey readers, Leesa is extending a discount rate – this tree normally sells for $399.00, but if you call her at 305-556-9772 or email her at info@catreesort.com and mention Zee/Zoey she will lower the price to $369.00 and she also has a finance plan available at 0% interest for 6 months. 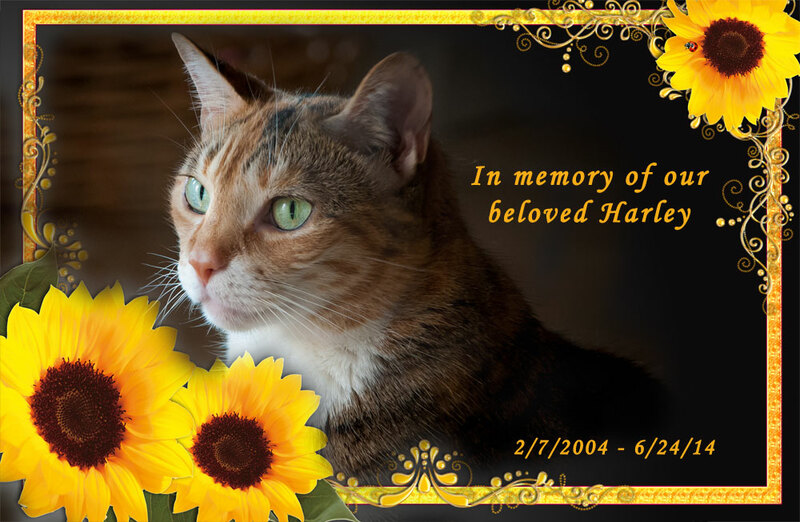 When you correspond with her, she can also advise on the best rates for shipping and she will do her best to assist in any way she can so that your cat(s) can experience the luxury that is Catreesort! 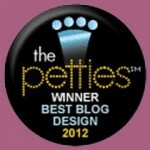 I thank Leesa and her team so much for the opportunity to review Catreesort. My cats are eternally grateful for this beautiful piece of custom furniture and I was not compensated monetarily for this review. 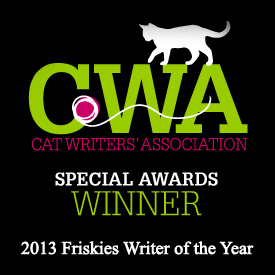 All opinions expressed are those of myself and my very happy cats. My sentiments exactly–it looks like the perfect cat house/refuge/ exercise solution all in one! Oh thank you for this review. 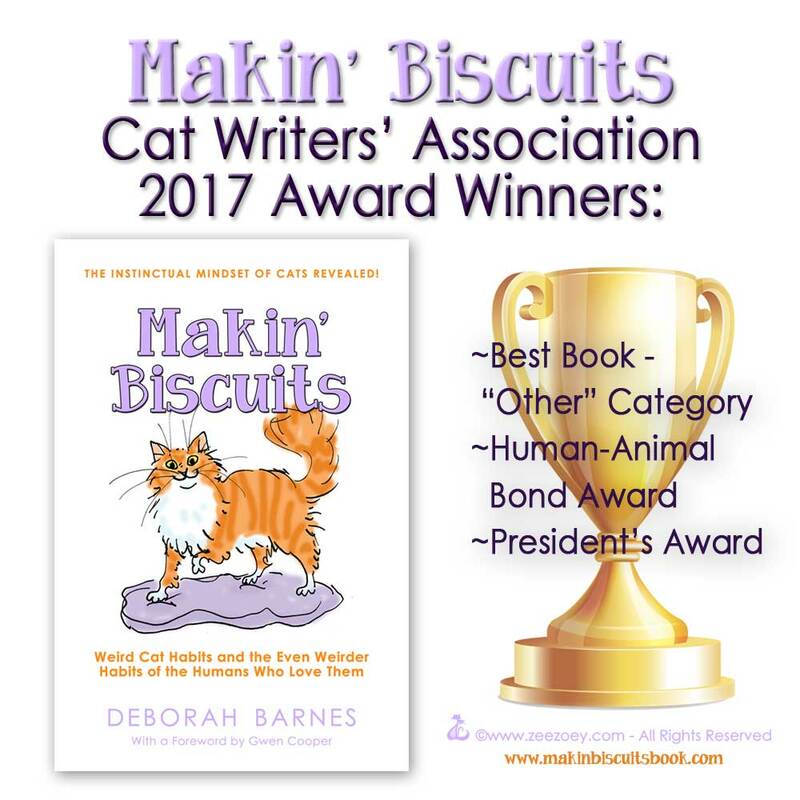 One always wonders and when someone reputable like you Deb Barnes, reviews a product we know we’re getting the honest review. Even better–it’s MADE IN USA! 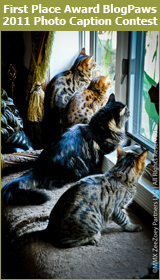 Definitely worth the price as the benefits outweigh the cost–active, healthy, confident cats as they still feel connected to mother earth. Can’t wait to order mine! Since I’m local, I’d love to meet Leesa as well. You’re local. Where are you in Miami. This is a great review! 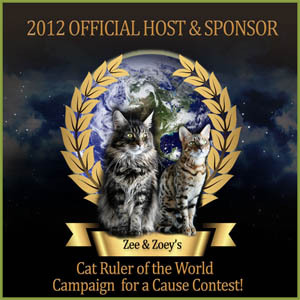 I would like to recommend this to my aunt who owns a dozen beautiful cats. She lives in Boston. I would also love to order Catreesort for my cats but I’m not residing in US anymore. BTW, will they accept orders outside US? Good Lord! Your tree is awesome and my 3 kitteh-sibs want one. Love your piccies too. Thank you so much PepiSmartDog – I always enjoy your company! What a wonderful tree! I have called and e-mailed the catreesort company, but to no avail. Can you let me know where I can get in touch with the company? Thanks for a great review of the product.